It seems to be coming from outside where the main water valve meets the building. 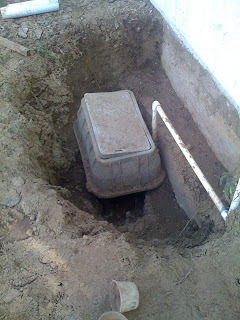 In order to be 100% sure of this, & in order to repair the leak if it’s down under the ground, is to dig. I know the hole doesn’t look so impressive, especially with the sprinkler box strewn so haphazardly over it to cover the work that we did until our friend Jim-The-Sprinkler-Man-Taylor comes out on Friday, but I have to say that I am proud of the work Brother & I did. It was so easy to dig in the lush Nevada soil. Made me so happy that unlike many other states, Nevada soil has no rocks in it. None. Just lush, rich soil that gives in to the shovel like ice-cream does to a hot ice-cream scoop. Actually, I must say, we worked for most of the day, & found that even with the water mains off, we still had a hole that filled with water in approx. 10 minutes. We bailed & bailed but couldn’t keep up with the leak. I got tired after removing about 75 gallons of water (in 5 gallon increments, don’t you know?) & still making no head way. That’s when my edu-ma-cation kicked in & I realized that there HAS to be a better Way of doing this… Images of water pumps rolled through my head & after a quick visit to our friends at Ahern Rentals we came away with a 2″ water pump & 50 feet of fire hose to Clear the hole of water in No Time. Turns out the pump worked well, but only kept us at EVEN with the leak… We were stymied, cold, & wet… so we cried out to the LORD. Truly. The ladies intercessory group in the parking lot (so fortuitously meeting on Tuesdays) prayed as well. And the LORD heard our prayers & sent us exactly what we needed: a foreman. When I say what we needed was a foreman, that’s just what I mean. Imagine if you will Brother & I, tired & work-worn, leaning on our shovels, resting, pondering what would come next. What I didn’t realize is that we hadn’t met the appropriate “shovels/workers ratio” to finish a given job. With the valve now exposed, we were confronted with something that neither Brother nor I had considered… it was suggested by John-The-Wiser that since the valve that was leaking was Good For Nothing, & fed nothing but a previously Vandalized & Broken line itself, that we should cut the valve off & cap it. Ourselves. Jackie for calling John-The-Wiser to come help us in our time of trouble. Jacqui, Pam, Helen, & Marta – the intercessory prayer group. John-The-Wiser – for his foreman-ing skills. This entry was posted in Uncategorized and tagged Incompetence, Joy, Ramblings, Weather by scoeyd. Bookmark the permalink. I didnt mean to laugh while I read this, but the women in the parking lot did it. I picture a wailing wall scene, and you and Ben were wearing armor, like the Romans. Well done on the pipe repairs. Good job. Thanks for sharing. Where is Elijah when you need him? A little fire from heaven would have cleared up all that holey water in no time! Yeni- surprisingly, a good time was had by all. Eugene – yes. We actually thought of that, but didn’t want to have the working pipes consumed as well. So we went with a pump instead. laura – brave? Desperate is more like it. And I give full credit for the completion of the job, successfully, to John-The-Wiser. I wouldn’t have even thought of doing the fix on my own, let alone attempting it.